This cake is trouble, you guys. I want to make it all the time. I want to eat it all the time. I want you to try it so you can join me. 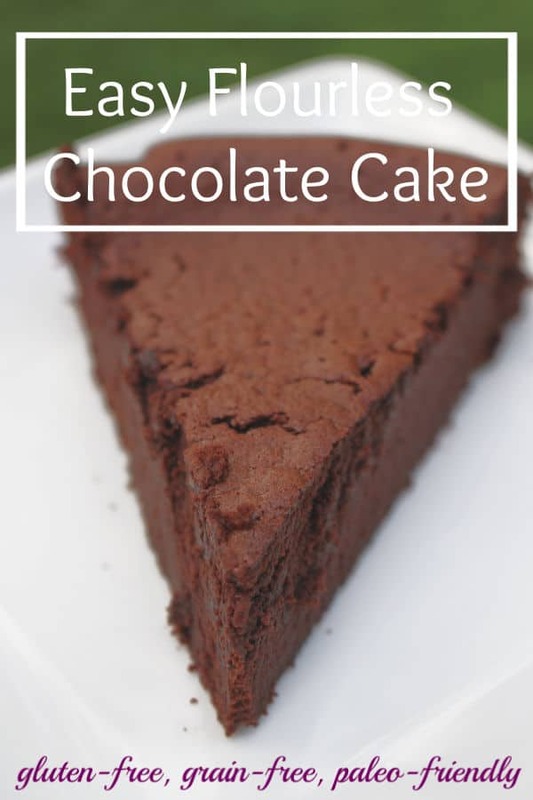 This flourless chocolate cake is perfect for an after-dinner dessert or a birthday celebration. Dress it up with a homemade caramel syrup or a drizzle of homemade strawberry syrup and homemade whipped cream for a fancier occasion. This delicious cake has only six ingredients and is made without gluten, grains, or any flour at all! Before I post the recipe for this lovely chocolate dream, let’s talk sweeteners for a minute. This flourless chocolate cake recipe is NOT keto-friendly. It contains coconut sugar (or maple sugar, if you prefer) and that gives it too much fructose to be considered ketogenic. You can use a different sweetener if you wish, but please know that I have only tried coconut sugar and maple sugar in this recipe and can’t provide you any guidance for using a substitute. In my experience, using maple sugar in this recipe gives the cake a better texture. I’m not always able to find maple sugar at a price I like, so when I only have coconut sugar on hand, I give it a few pulses in the food processor to make it as finely granulated as possible. 4. In a large bowl, mix together eggs, cocoa powder, sugar, butter, vanilla and salt until smooth. 5. Pour mixture into the springform pan. In a large bowl, mix together eggs, cocoa powder, sugar, butter, vanilla and salt until smooth. Pour mixture into the spring form pan.